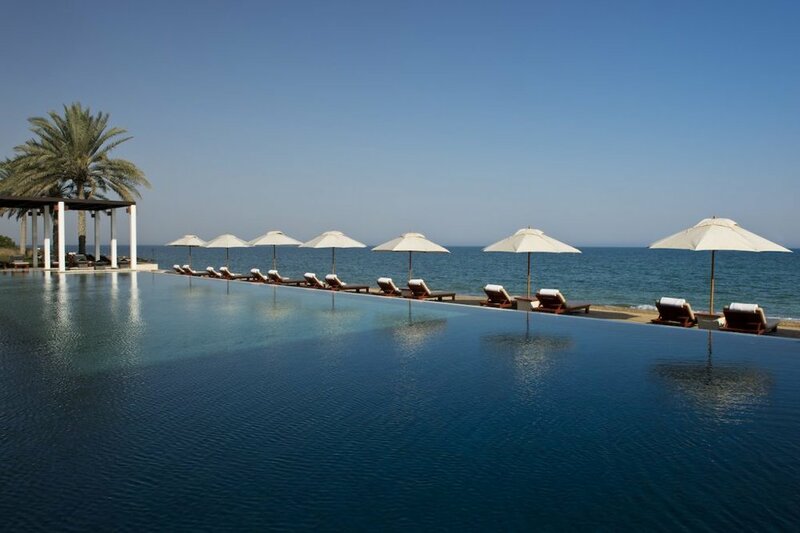 The Chedi Muscat is one of the longest standing 5-star hotels in Muscat, spread out over 21 beautiful acres. Run by luxury hotel group GHM, this location is as much a favourite for relaxation and sumptuous meals amongst the local Omanis as it is for tourists and travellers! When I heard that the hotel was just a short drive from the airport, I have to admit I was dubious. Wouldn’t it be too close to houses and roads to seem like a true retreat? Was I ever wrong! On entering the domed lobby, the smell of frankincense wafted through the air and we were greeted with refreshments and cold towels, which were absolute bliss after our 2-hour trip. This was followed by a personalised orientation, which is provided to every guest who walks in through The Chedi Muscat’s doors. The first thing I noticed as I gazed around was the design of the resort—a mixture of Omani architecture and Asian Zen-style. Full of clean lines and symmetry, an air of soothing simplicity permeated the grounds. There was a beautifully positioned black urn in line with a perfectly manicured green lawn; a meticulously trimmed hedge and strategically aligned palm trees that gently guided you to a clear blue ocean. Nothing but clear, blue skies and symmetry! The staff were just exceptional, probably the best I’ve experienced to date. And the secret behind it? They’re all happy. During my stay, I met 3 senior managers, all of whom have returned to the group after a break at some point. There are also a number of people in various positions who have been at The Chedi Muscat for quite a years (which is huge in its own right in an industry with such high turnover rates). One of the chaps I chatted with, Anoob, told me that he started off as one of the pool boys 15 years ago and is now the Serai Pool Cabana Manager. Overall, I’d like to dole out some serious high fives to the staff because they are all amazing! Simply put, The Chedi Muscat really isn’t a family hotel. The rooms are all either queen or king-size with no interconnecting rooms or options for twin beds although some accommodations can be made. The standard queen-size Serai rooms are perfect for those who plan on spending most of their time outside the room or are only staying for a night or two. If you prefer a bigger bed (or a bath instead of a rain shower), then upgrading your room will be worth it. Consider the Club Suites. More than twice the size of the regular rooms and stocked with tons of amenities (including complimentary beverages and snacks), these freestanding suites are for those who truly want to get lost in The Chedi bubble. Keeping in line with the Asian Zen feel, the decor is simple. Spotless wooden floors, a king size bed with crisp white linens, a terrazzo sunken bathtub, soft lighting—they all come together to create an incredibly luxurious and relaxing environment where you’ll feel completely at peace. Grab a tipple of your choice and just sit back and relax outside. If you can peel yourself away from the plush bed, step out onto your private balcony or terrace and settle into a sun lounger with your drink of choice and gaze out over the beautiful water areas or gorgeously manicured gardens. The Club Suite also comes with exclusive access to The Club Lounge where you can enjoy afternoon tea or canapés and cocktails in the evenings. There are 3 pools, one being family-only, which is some ideal planning on the hotel’s part! You’ll want to head straight to the other two adult-only pools. The Chedi pool—the first infinity pool in Oman—is where we spent much of our time, relaxing on the huge cabana beds and super comfy sun loungers. Of all the pools, this is the calmest and most relaxing and perfect for quiet lounging. Further along is the fabulous The Long Pool where they play chill music and offer Japanese-style food. It’s still low-key but with a bit of a trendy vibe and an eclectic mix of people that includes holidaymakers with well-heeled local business folks who frequent the gym and pool as members. Sadly, this pool was closed when I visited but it will be reopening at the end of September. Stick around the Chedi pool where you can hear the sound of the waves on the nearby beach as the sun begins to kiss the horizon. It’s truly a picture perfect scene during sunset and you’ll find yourself lingering by the pool to make sure you catch every last drop of the day. Of course, you can always head back to your suite’s private terrace where you can watch parrots swoop in and out of the picturesque palm trees as you let the last rays of the day wash over you. The Restaurant is a spacious room with high ceilings, chandeliers, and a pianist in the background. There are four open kitchens where chefs prepare everything from Thai to Indian cuisine. Having the chefs be able to interact with the guests means that not only can you see your food being prepared (always fun!) but the chefs can also watch as people enjoy their culinary creations. The Indian chefs gave us a thumbs up when they saw us tucking into our gorgeously delicious curries. The eclectic menu allows you to taste a little bit of everything so if you’re in the mood for some Lebanese starters and an Indian main, it’s all available for your selection. Even picky eaters will find something delicious to feast upon. The only thing I might suggest is that they add a few very simple dishes to the menu to accompany the more eclectic selections. 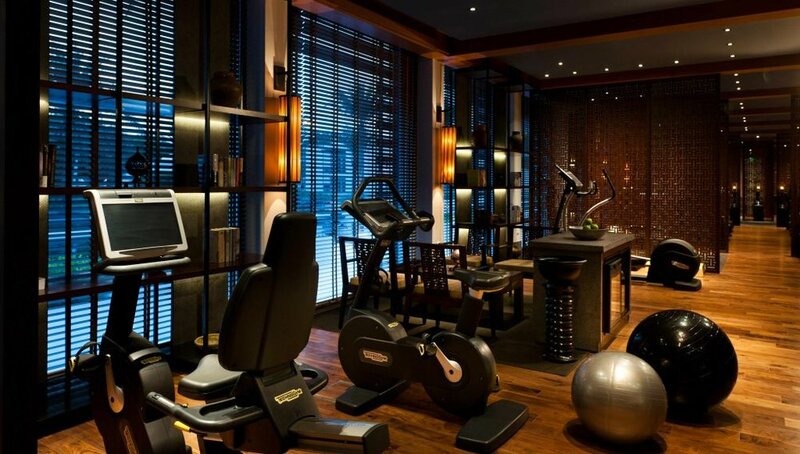 First, there’s the health club which is probably the poshest, most individual gym I’ve ever visited. It looks like a hybrid of a quintessential British library and an Asian hot spot. There’s top-of-the-line Technogym equipment but it’s on a wooden floor and you’re surrounded by dark woods and Asian-themed partitions. As you sweat it out on an elliptical, you might find yourself gazing onto a shelf with a carefully curated selection of books and objets d’art. On top of it all, the staff here were spectacular. 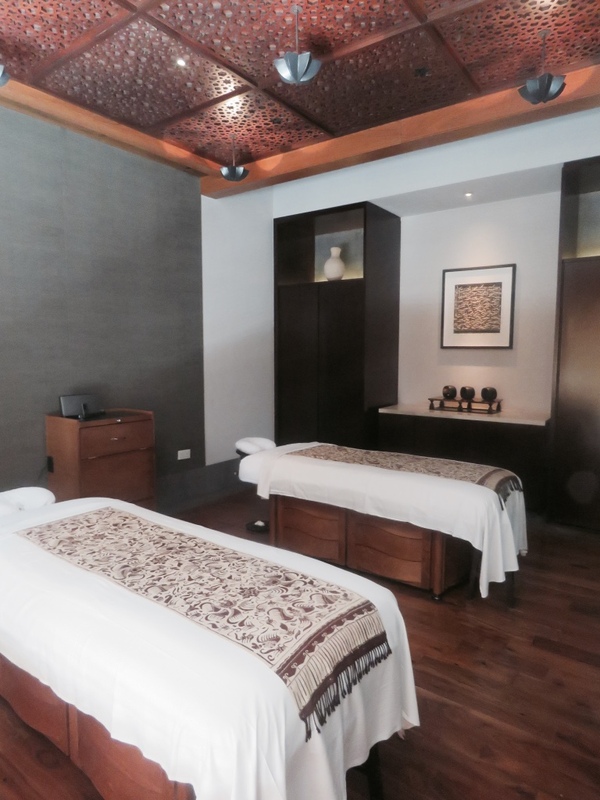 The spa is based on the holistic principles of aromatherapy, Ayurveda, and herbalism, combining ancient wisdom with modern expertise. 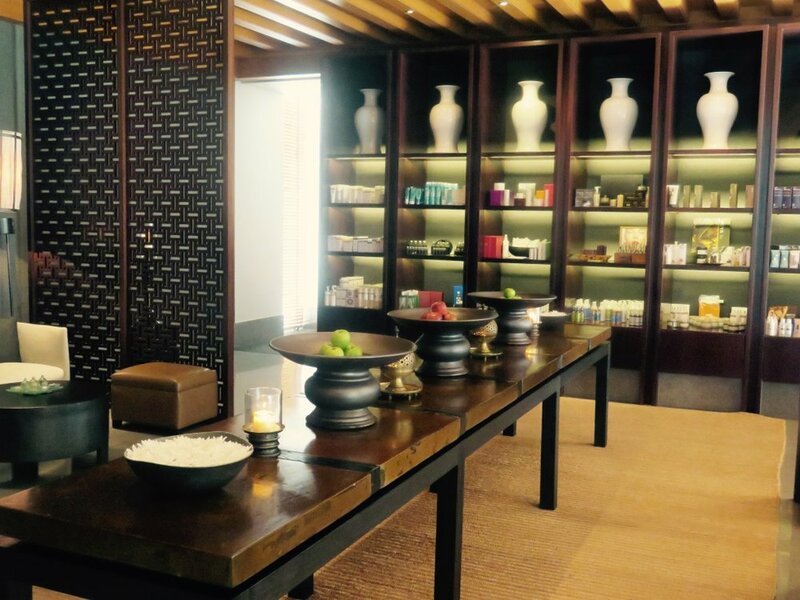 At 1,500 square metres with 13 self-contained luxury suites, a treatment here is guaranteed to be heavenly. VOYA, Ila, REN, and Karuna are among the products stocked here, all chosen because they are organic and have their own unique properties. VOYA, for example, is known for its natural healing qualities. As a major plus point, there are pregnancy beds here that allow mums-to-be to get in a well-deserved massage, even at 7 months along! Afterwards, dawdle in the relaxation room where you can sit and gaze out across the ocean in peace and quiet. The Chedi Muscat may not be the newest kid on the block but it is iconic and established. On top of that, the high praises from guests and the genuine happiness of the staff speak volumes. The service we received was first class and a stay here will leave you zenned out and wanting for nothing.